This week brought two books I hadn’t heard of before they showed up, but they both sound as though they could be rather interesting! I was hoping to get a review up in the last week, but I’m not quite done with the review I’ve been working on. It’s almost done, though, so I’m hoping it can go up this week! The Thousand Names, which will be released in hardcover/ebook on July 2, is a debut novel and the first book in a new series. 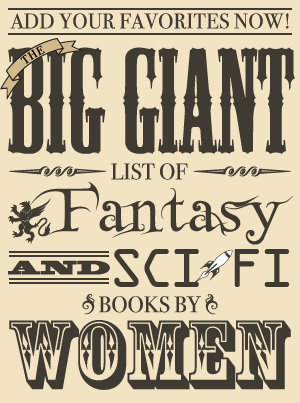 An excerpt can be read on the author’s website. 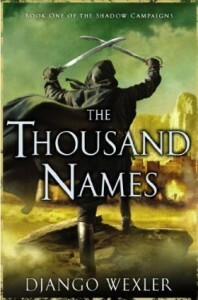 Goodreads currently has a US giveaway for 35 copies of The Thousand Names that ends on June 16. Enter an epic fantasy world that echoes with the thunder of muskets and the clang of steel—but where the real battle is against a subtle and sinister magic…. Captain Marcus d’Ivoire, commander of one of the Vordanai empire’s colonial garrisons, was resigned to serving out his days in a sleepy, remote outpost. But that was before a rebellion upended his life. And once the powder smoke settled, he was left in charge of a demoralized force clinging tenuously to a small fortress at the edge of the desert. To flee from her past, Winter Ihernglass masqueraded as a man and enlisted as a ranker in the Vordanai Colonials, hoping only to avoid notice. But when chance sees her promoted to command, she must win the hearts of her men and lead them into battle against impossible odds. The fates of both these soldiers and all the men they lead depend on the newly arrived Colonel Janus bet Vhalnich, who has been sent by the ailing king to restore order. His military genius seems to know no bounds, and under his command, Marcus and Winter can feel the tide turning. But their allegiance will be tested as they begin to suspect that the enigmatic Janus’s ambitions extend beyond the battlefield and into the realm of the supernatural—a realm with the power to ignite a meteoric rise, reshape the known world, and change the lives of everyone in its path. Monsters of the Earth will be released in hardcover/ebook in September. It’s the third of four books in The Books of the Elements, though each book is intended to stand on its own according to the author’s website. The first two novels in this fantasy series inspired by the Roman Empire are The Legions of Fire and Out of the Waters. Governor Saxa, of the great city of Carce, a fantasy analog of ancient Rome, is rusticating at his villa. When Saxa’s son Varus accompanies Corylus on a visit to the household of his father, Crispus, a retired military commander, Saxa graciously joins the party with his young wife Hedia, daughter Alphena, and a large entourage of his servants, making it a major social triumph for Crispus. But on the way to the event, something goes amiss. Varus, who has been the conduit for supernatural visions before, experiences another: giant crystalline worms devouring the entire world. Soon the major characters are each involved in supernatural events caused by a struggle between two powerful magicians, both mentored by the deceased poet and mage Vergil, one of whom wants to destroy the world and the other who wishes to stop him. But which is which? There is a complex web of human and supernatural deceit to be unravelled. 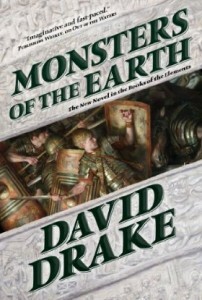 This new novel in David Drake’s ongoing chronicles of Carce, The Books of the Elements, is a gripping and intricate work of fantasy.